How can I take a screen shot and send it to RealNetworks Technical Support? A screen shot is a saved picture of content that appears on your monitor. Screen shots are helpful for technical support when you have received an error or you are experiencing program behavior that is hard to describe in words. 1. Reproduce the error, window, or image that you want technical support to see. Leave it up on the screen. 2. 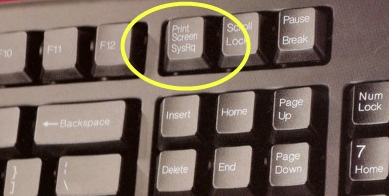 On your keyboard, press the Print Screen button (usually near the top right of your computer keyboard). - After you press this button, it will appear as though nothing happened, but the picture of your screen has been copied to the Windows clipboard. 3. Click the Start button at the bottom left of your screen. 5. Open the Accessories menu and click Paint. - If you are unable to find Paint after Accessories, click the Start button again, and click Run. Type "mspaint" (without quotes) in the Run as or Open field, and click OK.
- If you receive an error message after clicking OK, you may not have Paint installed. Contact your Windows Technical Support for information on how to install Paint for your version of Windows. 6. A Paint window opens. In the Paint menu, click Edit, then Paste. If you receive a message that says "Would you like the bitmap enlarged?" click Yes. Your image now appears in the Paint window. 7. In the Paint menu, click File and then Save as. A new window opens. 8. In the Save in field, choose Desktop. 9. In the File name field, type Realscreenshot. 10. In the Save as type field, choose JPEG (*.JPG;*.JPEG;*.JPE;*JFIF) . If JPG is not an option, choose one of the .bmp options. 1. If contacting us for the first time, click the Attach file link on our email form; find the document and click Open to attach it before clicking Submit. 2. If replying to a request, open the last email RealPlayer Technical Support sent to you. You can either reply to it or create a new email and type the email address given to you by Technical Support in the To: field. Choose the Attach or Attachment option (your options may vary with your email program; in Outlook it's the paper clip icon next to Send). Browse to and attach the Realscreenshot file on your desktop. "Something has gone wrong while running msiexec"